100 sessions. 200 speakers. 4 days. There’s so much happening at OSCON that it’s almost impossible to take in everything that interests you—let alone all the knowledge that could be useful to your team. Our advice? Divide and conquer. Bring your team to OSCON this year. Your colleagues will benefit by attending the sessions that impact them the most—and by being able to ask the experts questions directly, in the moment. And did we mention the team discounts? Save 20% per person when you register 3 to 5 people from one company. Please use TEAM in the discount field while registering to save. To take advantage of these company team discounts, please contact confreg@oreilly.com. 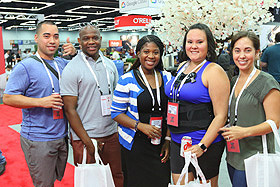 Bringing your team to OSCON is a great opportunity to build unity, learn together, and reaffirm your team's purpose. If you would like to host your team offsite while at OSCON, please reach out to our conference manager, Catharine Lipton, at clipton@oreilly.com to learn more. Please note: a minimum of five registered team members is required in order to reserve a space.